The Costume are in top quality and can use in any occasion. The costume includes the the body, the hands and the feet.the of the mascot are made of the FOAM. The material is light ,User could breather easily from the hole of the eyes, mouths, and the neck area. you will not feel uncomfortable to have it on for a long time. The costumes is adult size. it fits up 60.other size are available. you should contact with me before you order them. 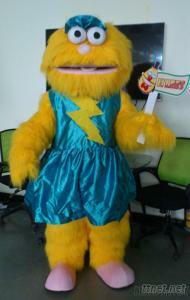 The Mascot costume is the same as the picture, you can get more picture about this costume if you would like. If you need any other character costume, please show me the picture, i can make it custom. Serious purchase, i am glad to answer any question from you..
We highly recommend these POLYFOAM mascots costumes. It is the perfect mascot for your school team, sport event or to attract people at A BIRTHDAY BUSINESS, A BIRTHDAY PARTY, HALLOWEEN OR any SPECIAL EVENT or business. Kids and Adults will love it too!! Fur Costumes: Hand wash or use large front loading commercial machine. Use cold water and mild detergent. Foam: Costumes Hand Wash or dry-clean only. Heads: Use upholstery spray foam cleaner or mild detergent and damp sponge. Gifts & Crafts, Party Supplies, Party Supplies/n.e.s.